Brownstone is excited to host our 20th Annual Mothers Day Brunch on May 14th, 2017 from 9-2PM. We will offer an incredible menu of foods to make all Mom’s and guests walk away happy and content! The buffet stations will include breakfast pastries, fresh fruits and salads, our FAMOUS “Tomato Basil Bisque” soup, Waffle & French Toast Bar, Meats, Pastas, Desserts, Juices, Coffee and a Glass of Champagne or Mimosa with every meal. Please make sure to call or email us with your reservation as we book up quickly! We take reservations only as we want our guests to enjoy their visit. 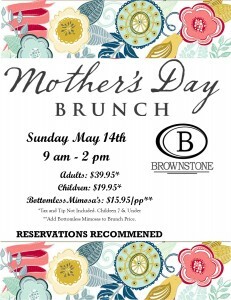 Please call us at 714-526-9123 or email us at info@brownstonefood.com. The price is Adults $39.95/pp* and Children $19.95/pp* and add Bottomless Mimosa’s for $15.95/pp*. We hope to see you all there for an incredible day! *Tax and Tip Not Included. Children 7& Under.